One of the very best things about Chin Chin has to be the variety of dishes. Their focus spans the cuisine of South-East Asia which is vast and contains some of the best flavours on earth. A lot of my favourite dishes come from this part of the world. Being our third or fourth visit we diversified and only ordered dishes we’d not yet tried. We hadn’t even planned this visit, we were happily walking up Flinders Lane to try and get in a late breakfast at one of our Melbourne mainstays Cumulus Inc. but as fate would have it the line was out the door and we were told their breakfast service would finish before we got a table. We did a quick one-eighty and strolled down the lane to Chin Chin for what was no longer brunch, but an early lunch. Being nice and early meant no wait time at all, we were seated almost instantly. It’s never too early for wine when on holidays (even though it was a working holiday for me) so a couple of glasses of the lovely house white were ordered while we looked at the menu. 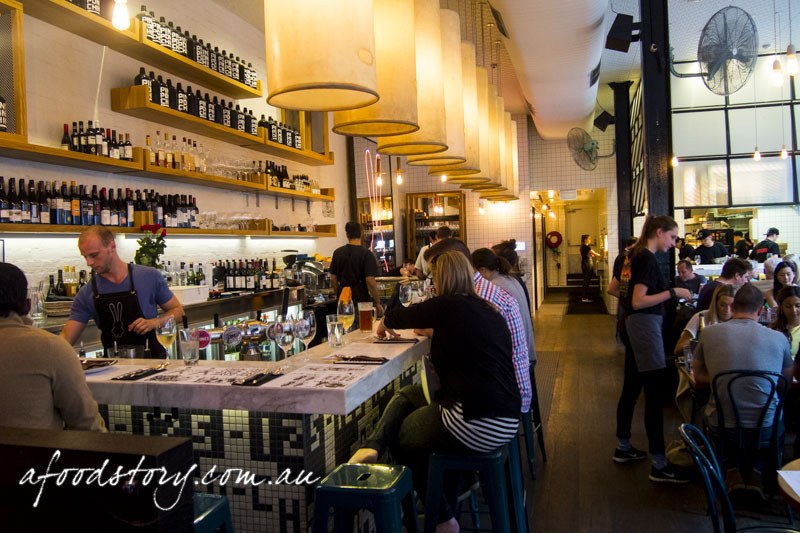 A dish that was recommended on our very first visit was the crispy barramundi so we knew that was on the list, but as for the rest it was really just a matter of seeing what took our fancy. 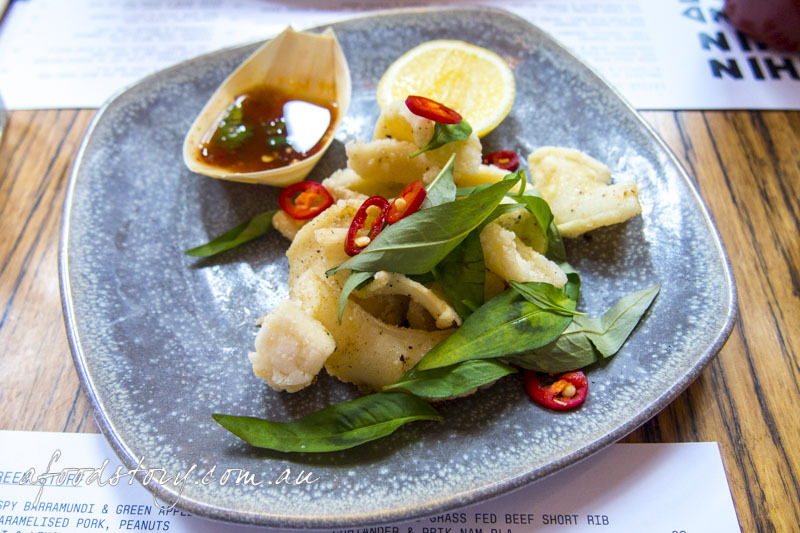 Wok Fried Salt & Pepper Squid with Nuoc Cham & Vietnamese Mint ($14.00 – small). For once we started out sensibly and went with the small serving of salt & pepper squid after seeing how good it looked at another table. If all squid/calamari was as incredible as this you would order it every time you saw it on a menu. Light and crisp, the floured batter had the right amount of seasoning and with the almost silky squid it was sublime, and even though I’m not a huge fan of Vietnamese mint it was the perfect addition. Probably the best salt and pepper squid I’ve ever had. 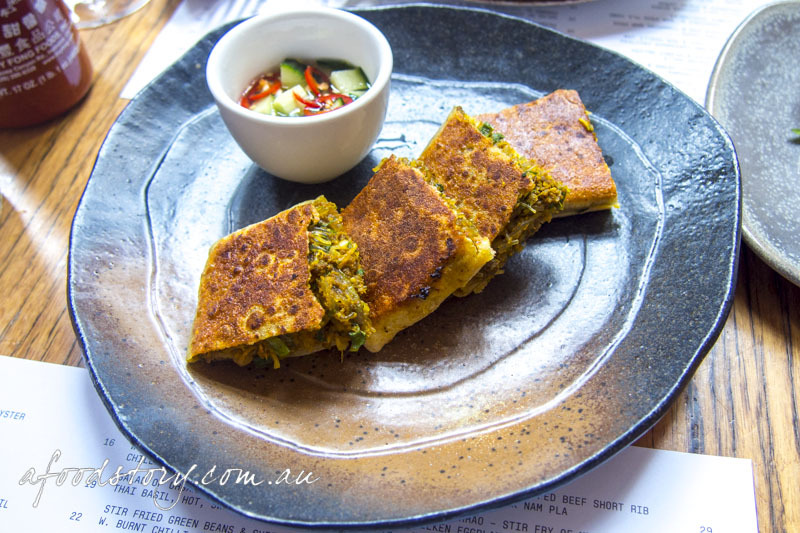 Grilled Roti Madtarbak filled with Indian Spiced Beef & a Cucumber Relish ($12.00). Loving roti, beef, Indian spices and cucumber Lex made sure we ordered the madtarbak this time round. Being grilled the roti was suitably crunchy, reminiscent of a spicy samosa but a bit more giving and it was quite adept at keeping the filling in place. Not only was the minced beef adequately spiced with cumin, coriander, turmeric and cardamom but there were also glass noodles, onions and spinach (I think) filling out the little squares. Balancing the great mix of spices was the cucumber relish, albeit a tad heavy on the vinegar side for Lex to truly love it. 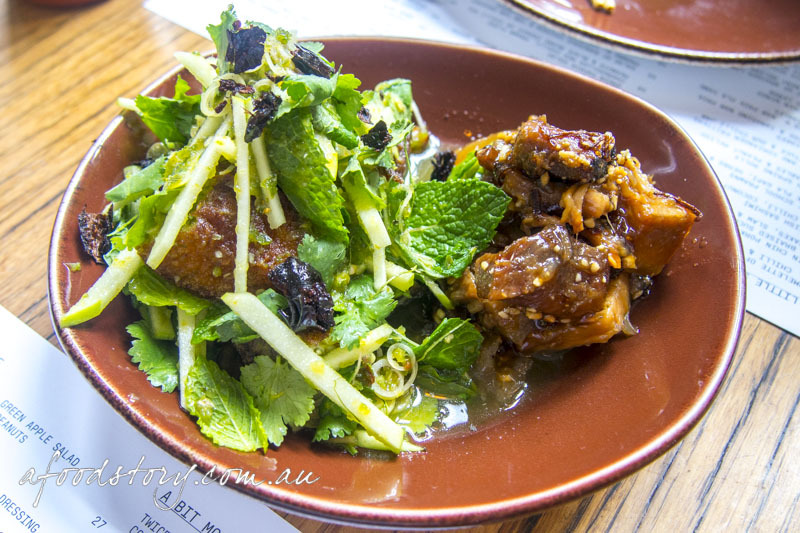 Crispy Barramundi and Green Apple Salad with Caramelised Pork, Chilli & Lemongrass ($26.00). Since the waitress’ recommendation on our first visit (which we didn’t take up at the time) we’ve wanted to come back and try barramundi and pork, making this our most anticipated Chin Chin dish of all time. Anyone who knows me would be aware that if there was a choice between fish or pork I’d rate the fish as highly as a lettuce leaf in comparison to my beloved pork, so having them in the same dish would be a new thing. Gelatinous and supremely sticky the pork was a hit, big flavours all round that were kept in check by the sweet and sour elements in the salad. Quite opposite to the pork was the fish, impeccably cooked and holding up to its crispy namesake. The barramundi was awesome and to my surprise it was an even better match to the apple and herb salad. What element was my fave? It had to be the pork but only by a smidge. Pad Kaphrao – Stir Fry of Minced Free Range Chicken, Silken Eggplant & Baby Corn with Holy Basil, Oyster Sauce & Scud Chilli ($25.00). Our final dish was again something different, but familiar all the same. It was the mention of scuds that caught my attention as I love both the heat and the flavour they impart. 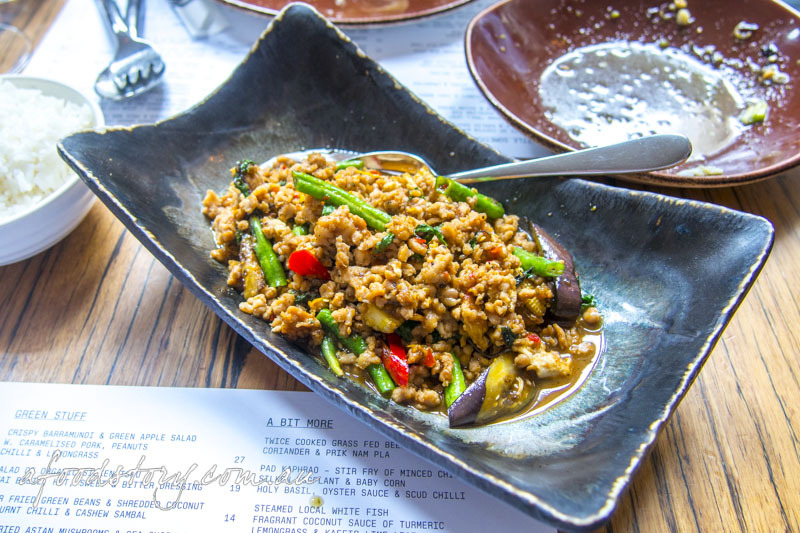 It may appear similar to larb gai in that minced chicken is used but to keen Thai food lovers out there the name gives it away – this is Thai basil chicken. Both fried and fresh holy basil created the backbone that could be tasted throughout the dish and the soy and oyster sauces gave it a subtle richness. Though it was the silky eggplant and heat from the scuds that made this stand out from other Pad Kaphraos I’ve had in the past. Another big tick once again. 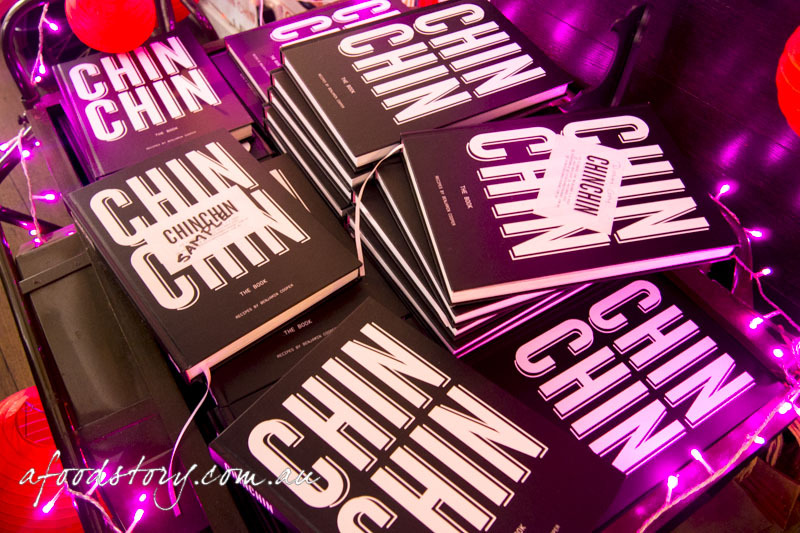 We were impressed by everything we ate (and drank) at Chin Chin. In fact, there is yet to be a single dish on the menu we wouldn’t hesitate to order again. Another important thing to note is that we are slowly learning the right amount of food to order here. This time around we were only slightly over the limit, which was a nice change. If Cumulus Inc. is our breakfast/brunch Melbourne mainstay then I would have to say that Chin Chin holds the lunchtime spot with ease.